TNPSC Recruitment Notification: Dear job seekers, here we are with all the latest notification of TNPSC. Have a short glance at this page to get all the needed information on the TNPSC Recruitment Notification. This is modern era where unemployment is one of the biggest problem faced by most of the young population. And getting a government job is dream for many. Here at winmeen we are helping those people to get employment in government sectors. We often come out with the latest TNPSC Recruitment Notification and other government employment notification. TNPSC or the Tamil Nadu Public Service Commission is one of the important state government sector which takes the responsibility in finding out the vacant positions in various government sectors and release TNPSC Recruitment Notification to enroll all the needed employers. And it is necessary to stay connected with the government to find of their TNPSC Recruitment Notification and here in our web portal we are helping the job seekers by acting as a medium of connection between the government portal and we give you all the detailed information of the TNPSC Recruitment Notification. When a TNPSC Recruitment Notification is released the government passes the notification either through online portal or offline portal. In case of offline announcement the notification is been released in the TNPSC Bulletin and in mass media advertisement will be passed. In case of online TNPSC Recruitment Notification the announcement will be uploaded in their web portal. The TNPSC official webpage is www.tnpsc.gov.in . Candidates can look up the official page for regular updates on the TNPSC Recruitment Notification. TNPSC takes the responsibility in passing the recruitment, deciding the number of candidates, releasing syllabus, providing answer key and model question paper, conducting exam, deciding the exam centers, preparing question paper and releasing answer key for the question paper and releasing key answer, result and cutoff marks for the exam that is been conducted. The main aim of this is to ensure transparency in employment opportunities of public in the state of Tamil Nadu. TNPSC or the Tamil Nadu Public Service came into commencement from the year 1929 and it is functioning efficiently in the state. It is a kind of constitutional body which is mainly performing the function of recruitment. It is located in Tamil Nadu with its headquarters at Chennai. At present the Chairman Dr. K. Arulmozhi I.A.S officer, Secretary is M. Vijayakumar IAS and the Controller of Examinations is V. Shobhana. At present there are about 400+ staffs working in the department. They all operate with a motive to provide public service for the common people. Their website is at the web portal or web address or url at www.tnpsc.gov.in. 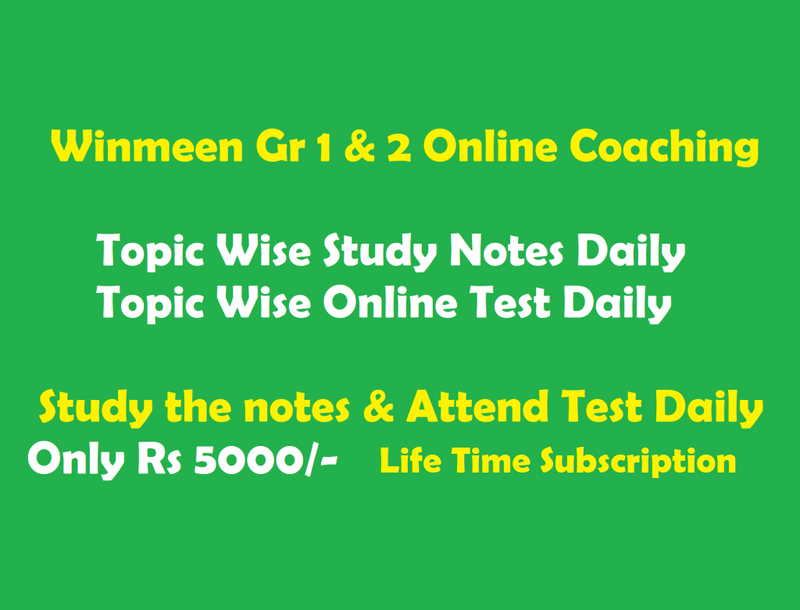 Candidates can stay with us at www.winmeen.com for details on the TNPSC Recruitment Notification updates and also we are providing easy coaching through online for candidtes who are in need for TNPSC preparation help. This year the TNPSC Recruitment Notification has been released and we have provided all the information in our portal start reading it and also share it with your friends who are seeking for TNPSC jobs. sir/mam do you provide study materials for the post tnpsc assisstant system engineer .